Water is one of our most precious resources—and today in California, it’s also a scarce one, as we face the state’s worst drought in modern history. In response, we are working vigorously to conserve water in our operations and at our facilities, engage our employees to reduce water use and help our customers do the same at work and at home. We are also collaborating with key partners to limit the threat of wildfire due to the drought and protect the many watersheds that contribute to the vibrancy of our state. Our response to the state’s severe drought conditions is governed by an internal Drought Task Force, charged with identifying and working to address drought impacts on PG&E’s operations, as well as our customers and communities. Led by the task force, we have identified much we can do, given the link between energy and water usage. 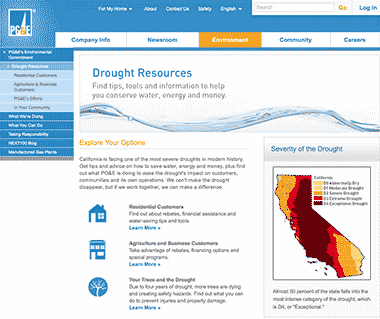 PG&E’s website features drought resources, including tips, tools and information to help customers save water, energy and money. Water is essential to operating our infrastructure—including our vast network of hydroelectric generating stations—just as it is essential to our customers in their everyday lives. At the same time, nearly 20 percent of California’s electricity use goes toward moving, treating, disposing of, heating and consuming water. This connection, also known as the “water-energy nexus,” places PG&E in a unique position to help our state and our customers. Limited water supplies as a result of the drought have led to a water-sharing agreement between PG&E’s Diablo Canyon Power Plant and San Luis Obispo County. In 2015, the County’s Board of Supervisors approved a plan for PG&E to begin providing excess desalinated water to the county for use in fighting wildfires. The board is also studying additional ways the excess water can be used. PG&E does not use freshwater for cooling at any of our power plants. At the Diablo Canyon Power Plant, we use saltwater from the Pacific Ocean for once-through cooling. The 2,240 MW nuclear power plant has a maximum discharge of 2.5 billion gallons per day, set by the facility’s Clean Water Act permit. PG&E closely monitors the marine environment at the plant by conducting regular studies and sampling, also required under the plant’s Clean Water Act permit. In May 2014, U.S. EPA issued federal regulations under Section 316(b) of the Clean Water Act to minimize adverse environmental impacts from facilities that use once-through cooling. The rule allows Diablo Canyon to continue to be regulated under California’s once-through cooling policy adopted in 2010, which is considered to be at least as stringent as the new federal regulations. Under state policy, nuclear facilities may be granted an alternative to the compliance requirements if they meet certain cost and technical feasibility criteria. The State Water Resources Control Board will decide whether to grant PG&E the alternative compliance. In addition, PG&E uses an on-site desalination plant to generate the majority of freshwater for Diablo Canyon to support the internal operations of the facility. PG&E relies on air for cooling at its three natural gas power plants. Humboldt Bay Generating Station is cooled with air radiators using a closed-loop liquid coolant and requires minimal water use. We use an air-cooled condenser at the Gateway Generating Station, which uses approximately 97 percent less water and discharges 98 percent less wastewater than a traditional once-through cooled plant. The similarly designed Colusa Generating Station also uses dry cooling and a zero liquid discharge system that recycles wastewater. 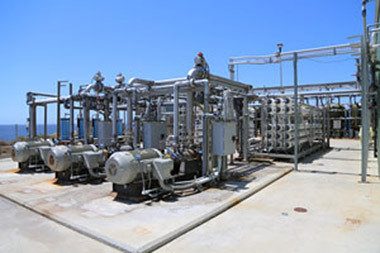 PG&E uses some freshwater for internal operations at the plants, but these are largely closed-loop systems that minimize the amount of water consumed. Helms Pumped Storage operates between two reservoirs in the Sierra Mountains. PG&E owns and operates the nation’s largest investor-owned hydroelectric system. Our hydroelectric power plants are largely non-consumptive, meaning that after water passes through turbines to produce electricity, it is returned to the river. PG&E also uses water for energy storage to help balance daily variations in electric demand at the 1,212 MW Helms Pumped Storage Project. Located more than 1,000 feet inside a mountain, the non-consumptive Helms facility alternately dispatches water from an upper reservoir to a lower reservoir to produce electricity when demand is high, and pumps it back uphill when demand is low. PG&E’s offices and service centers rely on water for restrooms, kitchens, mechanical system cooling, vehicle washing and landscape irrigation. In 2009, PG&E set a five-year goal to reduce water usage in offices and service yards by 20 percent by the end of 2014. Given the drought, we redoubled our efforts to conserve water and engage our employees. As a result, we reduced water use by 13 percent in 2014 and achieved a total five-year reduction of 30 percent. We also achieved LEED Gold certification for our headquarters complex in downtown San Francisco—the first time the U.S. Green Building Council has awarded this honor to an entire office complex. Best water conservation practices that contributed to this certification include use of low-flow toilets and urinals, the installation of auto-faucets and aerators in sinks, and a state-of-the-art chemical control system in our cooling towers. PG&E offers customers a wide range of options to help them reduce their water use. Our water-saving solutions for residential customers include energy efficiency rebates for high-efficiency appliances, such as clothes washers and shower heads, and free wood chips for landscape mulching, which reduces evaporation. We also offer incentives to agricultural customers who convert from sprinkler systems to water-efficient drip irrigation, as well as programs for energy efficient pumping systems. Altogether, customers who participated in PG&E’s programs reduced water usage by about 1.8 billion gallons in 2014, based on an analysis of our most common energy efficiency measures that deliver water savings. Beyond the incentives PG&E offers, our employees also work directly with farmers to make sure they’re familiar with and take advantage of all the resources we provide. 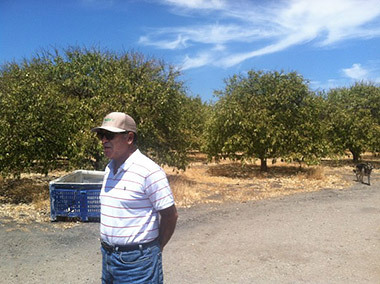 One of these partnerships was described in a National Geographic story featuring PG&E representative Joe Segura and Central Valley farmer Barat Bisabri, who installed micro sprinklers with a PG&E rebate and cut his water use by 25 percent. At the Greater Bakersfield Water Conservation Day, PG&E joined other local groups to showcase the importance of water conservation during the state’s record drought. 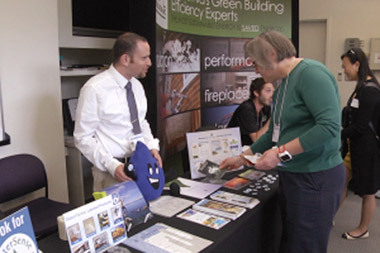 Residents toured booths to learn about conserving water at home, including water efficient landscape and irrigation techniques, residential water conservation and energy efficiency. Conserved water at PG&E facilities. Last year, we reduced water use by 13 percent and achieved a five-year reduction of 30 percent, surpassing our annual and five-year goals. We are now using 48 million fewer gallons of water per year than five years ago, and we aim to reduce water use by another 4.5 percent in 2015. Engaged our employees. PG&E led a grassroots Water Wise Pledge Campaign that encouraged employees to make a pledge to reduce their water usage at work and at home. More than 10 percent of our workforce, or nearly 2,300 employees, pledged to take actions such as taking shorter showers, checking for leaks and installing water-saving aerators. Strategically managed our hydroelectric facilities. Working with state agencies and other stakeholders, we strategically generated less hydropower so that we could save water in our reservoirs to generate power during the summer peak periods. Conserving this water early in the season also helps ensure adequate water supplies for communities, supports recreational opportunities and benefits the many species that depend on water. Took new steps to prevent and mitigate wildfires. In addition to our routine vegetation management program, through which we inspect all 134,000 miles of overhead electric lines, PG&E provided significant funding to local Fire Safe Councils throughout the state in a community partnership to prevent fires. Expanded agricultural energy efficiency programs and incentives. We added a new program for agricultural customers who install low-flow irrigation nozzles or convert sprinklers to drip irrigation. We also increased rebates and our outreach through events such as the World Ag Expo, and we formed agricultural customer advisory groups to provide feedback on the types of programs and services that would be most helpful to their businesses. 1 Net operating capacity on December 31, 2014: Diablo Canyon: 2,240 MW; Humboldt Bay Generating Station: 163 MW; Gateway Generating Station: 580 MW; Colusa Generating Station: 657 MW. 2 Freshwater sources are well water for back-up and emergency purposes. 3 Increase due to a combination of operational conditions and improved tracking of water usage. 4 This figure represents the water supplied to offices and service yards managed by the Utility’s Corporate Real Estate Strategy and Services department for the 12-month period from October to September. The data includes between 125 and 135 sites between 2012 and 2014. 5 PG&E monitors water usage at permitted, public water systems owned and operated by PG&E. These systems are metered in accordance with state regulations. 6 These figures incorporate once-through cooling discharge (equivalent to withdrawal) plus estimated reverse osmosis system brine/backwash discharge. 7 Colusa Generating Station uses a zero liquid discharge system. A septic system is used to manage sanitary waste. 8 Of these totals, a portion of water was reused for other hydrostatic testing prior to being discharged. Amid California’s unprecedented drought, and the groundbreaking executive and legislative action it has inspired, PG&E will continue our work across the board to proactively promote water conservation, outreach and education, and wildfire prevention—both at our facilities and job sites and within the communities we serve. For the 12th consecutive year, PG&E held a Water Conservation Showcase at our Pacific Energy Center in San Francisco, bringing together hundreds of industry professionals to hear from experts and engage with new technologies. 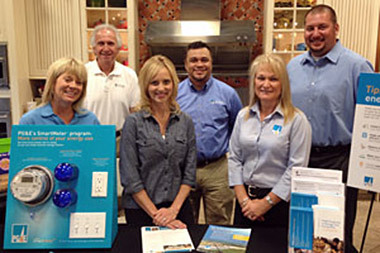 For PG&E, the event is an extension of the company’s focus on energy efficiency and sustainability, highlighting the direct connection between water conservation and energy use.